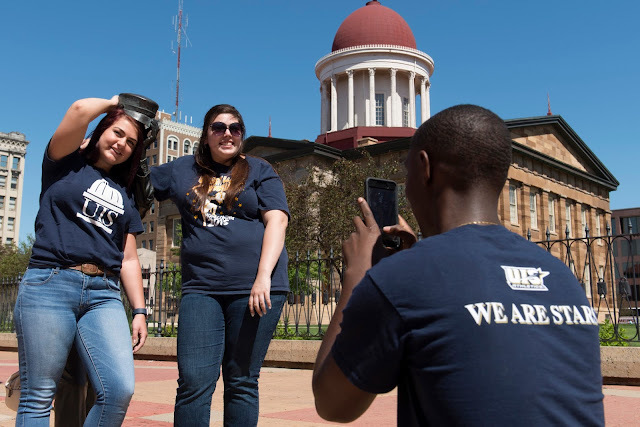 University of Illinois Springfield students can now take advantage of a new downtown Springfield discount program at stores and eateries. Deals vary, but many include a 10 percent discount or buy-one-get-one-free offers. All students need to do to take advantage of the discount is show their i-card at businesses displaying the Downtown Discounts decal. The discount program was created by State Representative Sara Wojcicki Jimenez’s Higher Education Student Advisory Committee, made up of students from UIS and Lincoln Land Community College, in partnership with downtown businesses. “I am so proud of these young men and women on my Higher Education Advisory Committee. They have taken their role beyond discussing legislation to actively working for the betterment of our community. The discount program they have spearheaded will help get young adults involved downtown, and hopefully, develop a relationship that will make them want to stay here,” said Rep. Jimenez. The Downtown Discounts program launches with 10 participating businesses, including Springfield Vintage, Custom Cup Coffee, Daisy Jane’s, the Hoogland Center for the Arts, Jade’s Far East Emporium, The Roost, Wild Rose, Studio 6, Z Bistro and Udder Hut, Jojo’s Street Cuisine and Recycled Records. In addition to the new Downtown Discounts program, UIS has had a longtime i-card perks discount program with many Springfield businesses.